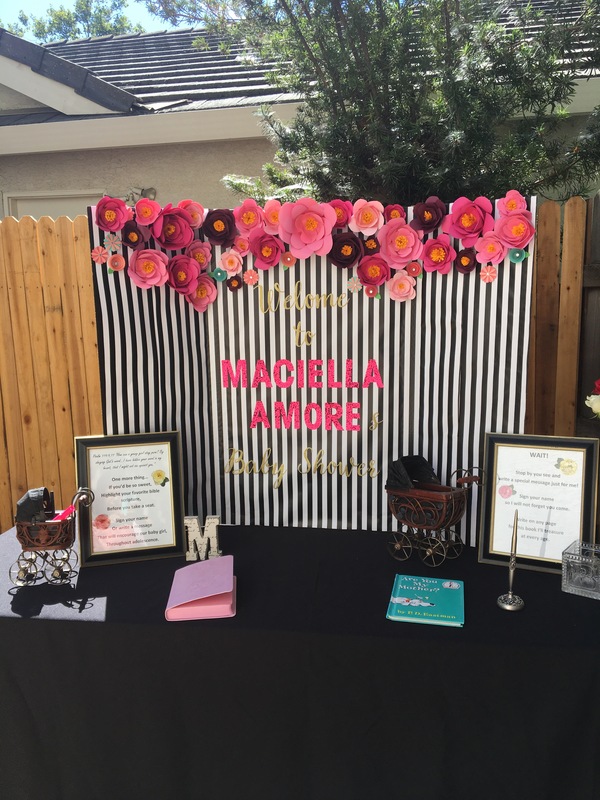 The event was hosted in our backyard and inspired by a Kate Spade theme. I found most of my inspiration from posts on Pinterest. Take a look at my board here, if you’re looking for the original ideas or more posts on a Kate Spade themed party. ​Upon my guests entrance, they were greeted with a welcome poster board that announced our baby’s name. This was very exciting since this was the first time anyone was seeing or hearing of our baby girl’s name. Rather than announcing it in the middle of our shower, like we’ve done in the past, I thought it would be special for guests to see it immediately upon their arrival. 2) a Precious Moments Bible, where guests could highlight a favorite verse. When I host events in my backyard, I love transforming it into a different environment. Sure everyone knows they’re entering a backyard, but by putting “eye capturing” decor around the yard, it draws my guests attention away from things like my pool pump or trash cans, and directs them toward the festivities. I put our gift table near the entrance of our backyard, so guests didn’t have to tow their gift around. Above our gift table, I strung our favorite ultra sound photos in chronological order. I also, put a baby bottle piggy bank and a decorated suitcase for cards. Our photo backdrop was absolutely perfect! With flowers framing the top of the backdrop and our daughter’s nickname on staggere boxes on the side of the frame. We are well aware of how difficult her full name would be for some to pronounce, so we presented her nickname as well to ease our guests of any name-butchering. To be honest, I had her nickname well before we had her full name. I’m often asked, why didn’t I just use her nickname as her full name? It’s because my husband wanted something a bit more unique with a special meaning. Since “Maciella Amore” means more of heaven and love, it seemed very fitting; because that is exactly what she’ll be adding to our home. On a little pedestal, I had photo props to add to the fun. They always seem to be a favorite at our photobooth. After all who doesn’t like a silly photo now and then. On the menu, was roast beef, turkey and chicken crossantwiches, kale salad, fruit salad, angel eggs, meatballs, mini sausages, baguettes with spinach dip, pan dulce (Mexican sweet bread) and a veggie tray. For drinks, we had cucumber-mint water, lemon-strawberry water, coffee, sparkling lemon-watermelon and sparkling pink lemonade. All were very refreshing on a hot summer morning. Our guests sat along tables draped with pink table cloths and black-and-white stripped runners. As much as I would’ve like black table cloths, it would’ve made for an uncomfortable dining experience for my guests. The black would’ve absorbed all the summer heat. For centerpieces, I spray painted wine bottles gold and added fresh flowers. Originally, I wasn’t planning on using roses but after discovering a great deal on them, I couldn’t resist. I picked up three different shades of pink and one white bouquet. Baby Ice Cubes– every guest received a mini plastic baby frozen in an ice cube. The goal of the game is to melt the ice cube enough to free the baby. The first guest to yell, “My water broke!” with a baby completely free from ice wins. There were no specific rules or restrictions on how to melt the ice cube. Chocolate Poop-I took ten different chocolate candy bars and melted them onto ten different diapers. My guests then attempted to identify each candy bar. The one who identified the brand of each of the ten chocolate bars correctly won. Diaper Bag Guessing Game-I divided up my guests into groups of five. Each member of the group was given 30 seconds to put their hand into the diaper bag and without looking, identify the contents of the bag. The group could not start writing down their items until the entire group had finished putting their hand in the bag. The group who identified the most items inside the bag correctly won the game. Change the Baby’s Diaper-Guests were paired in twos. One was identified as the Mommy and the other the baby. The Mommies were given 2 minutes to create a diaper on their baby using one roll of toliet paper. The most secure and efficient diaper won. If you haven’t noticed, we didn’t have a dessert table. My hubby and I try to minimize sweets, which is easier to do when they’re not around. Although we did keep our sweet-toothed guests in mind. We had white chocolate pretzels and popcorn in favor bags as well as at our guest dining tables. To minimize the time our guests would be outside on a Californian summer day, we started our baby shower at 10am. We thanked our guests for all their love and blessed them around 12pm. Since we were all having so much fun, many of our guests stayed afterwards to take a dip in our pool. I’m so incredibly thankful to all those that were able to make it to my shower. We had a wonderful time because our guests made it special. 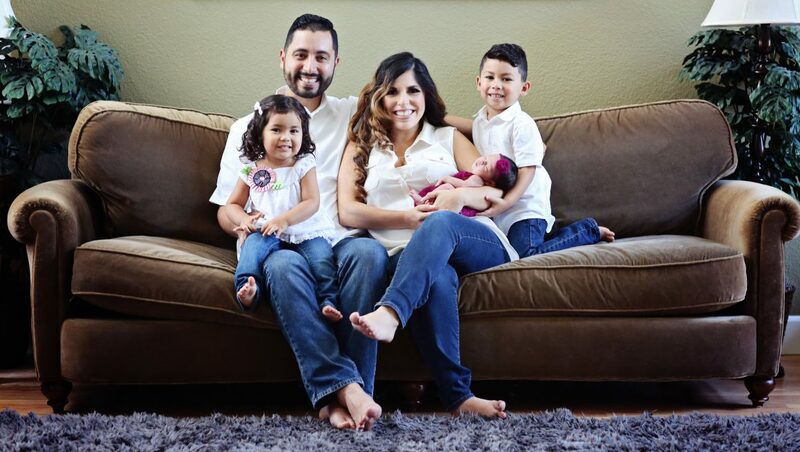 We truly feel humbled by everyone’s love for our family and soon-to-be baby girl. May God bless all our family and friends tremendously for being such a blessing to our family.